Immersive theatre isn’t a new concept. But Immersive Dinner Theatre, a concept that has come and gone with the eras, has now returned to the theatrical community in a unique style called Passion Nation. 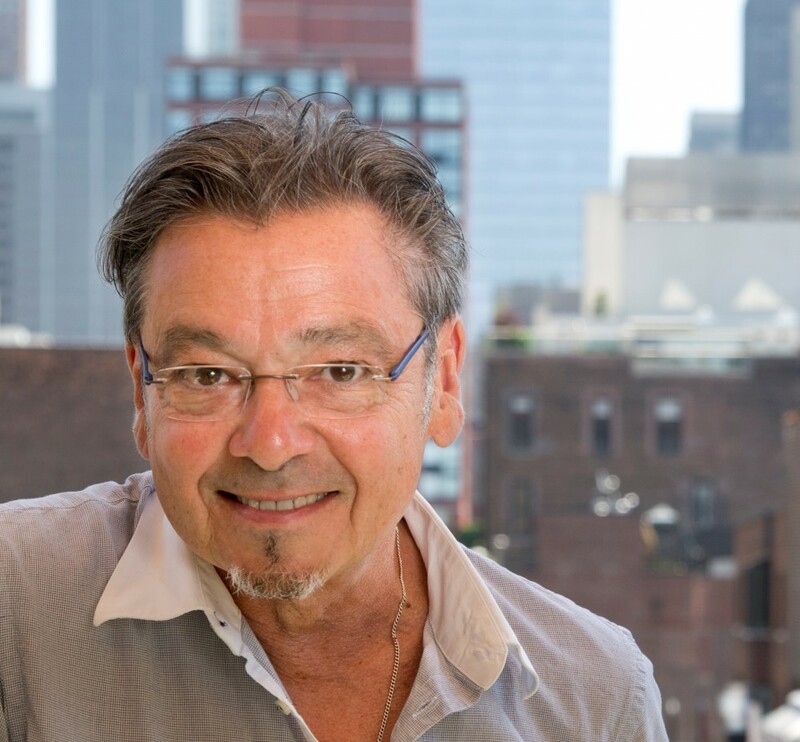 Director Bill Castellino, whom you know from his recent award winning musicals, Cagney and Desperate Measures, has some inside scoop on its roots, both as director and writer, so as to enlighten us. After attending a press evening of Passion Nation, Theater Pizzazz had the opportunity to have this conversation with Mr. Castellino about this uniquely new experience, currently running at The Lightbox Event Space, and its role in theater. Q – Sandi Durell (SD): What do you believe will be the greatest accomplishment if this new dinner theater experience proves successful? Is it the message or something else? 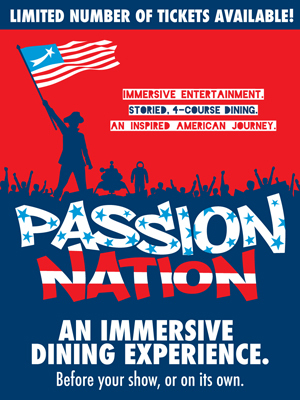 A – Bill Castellino (BC): Because PASSION NATION is such an unusual theatrical / dining adventure, we hope guests will have an equally unique reaction. We hope it is thoughtful, dazzling, touching and delicious! As we explore astonishing moments in our nation’s history via live actors and state of the art video imagery / sound, we also share a carefully selected menu corresponding with these events. Additionally, there are moments in PASSION NATION, wherein the guests are able to chat with their companions, meet other attendees, and share their thoughts on the events that are unfolding before us. The message is very important – but the way we communicate the message is what sets PASSION NATION apart. We hope we are inventing a new kind of entertainment that is provocative, beautiful, and fun! SD – Bill, you were chosen to write and direct the theatrical piece to mesh with the dinner intervals that take the audience through significant time lines. Why do you think you were picked for this particular assignment and who brought you aboard the project? BC -A colleague and friend, Loren Paul Caplin, was hired as a consultant on PASSION NATION. Loren recommended me to producer Jerry Stone citing my experience with new theatrical projects, special events, my use of media therein and my love of entertaining. The first meetings stimulated a great brainstorm – our aesthetic commonality was clear from the beginning. Happily, this exciting collaboration has gotten stronger and stronger. SD – Were you given a specific road map by the producers regarding their intentions of what they wanted to say to audiences or was it a collaborative process in which you were included from the beginning. BC – Jerry Stone and David Palmer’s company LVSTER has a clear goal to enhance our lives in entertaining and in original ways. This is a broad mission but was the driving force behind making PASSION NATION. Ours is a lively and creative collaboration wherein I was supported, challenged, and encouraged. We set out to make a companion experience to a Broadway or Off-Broadway show; however, as PASSION NATION emerged, we discovered that it can be paired with another show but also stands alone. We think PASSION NATION works as an inspiring and patriotic reminder of the obstacles faced and overcame with invention, selflessness, humor, and courage as the Founding Fathers and Mothers invented America. SD – What kind of research did this new job require to begin the writing process? Can you talk about the challenges. BC – One of the best parts of my job is taking a deep dive into unfamiliar topics. I know my share about our history but the need here was to immerse myself in not only the facts but the feelings associated with great accomplishments. The assignment to identify six fundamental moments that shed light on the American journey was daunting and thrilling. Jerry and his team brought a very clear idea about the format, the use of media, and the concept – and it was my joy to find the specific moments and invent a theatrical style wherein these moments could be enhanced by the technology, explored with human emotions, and happen with dinner – all in eighty minutes! I wrote the first draft within a few weeks, rewrote for another month, rehearsed for three weeks. We played to our first audience ten weeks after I began! SD – This immersive dinner theatre encompasses everything from multi media / video to food to actors telling the story. A lot of elements coming together. BC – All the elements of PASSION NATION were created simultaneously. Developing each episode meant creating the visual elements, the spoken words, the costumes, music, and menu at the same time. Of course, all these facets continued to be rethought and reconsidered as the script was reworked, but the opportunities offered by the technology, the language, and the food were addressed from the beginning. SD – Might Passion Nation develop other themes that fit into a broader aspect for this kind of immersive dinner theater? If that were the case, what might you think about for the future? BC – We are very proud of the singular format of PASSION NATION – it could absolutely serve as a road map for other immersive and conceptual experiences exploring other themes. PASSION NATION’s topic is American accomplishment but we have discussed addressing music, sports, and other worthy and dimensional subjects. Passion Nation is currently at Lightbox Event Space 248 West 37 Street, NYC for a limited run.